You Can Make a Difference for Dads in Your Community > Here's How! I have a great option for you to support NFI as we close out 2014: help your own community by providing an organization of your choice with resources to help them serve more fathers and families! 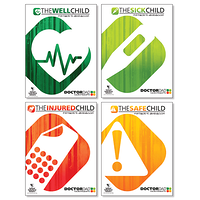 Give the children in your own backyard the gift of an involved father this coming year. You can support the fatherhood program efforts of an organization in your own backyard (think Salvation Army, Community Action, Head Start, a church, or Goodwill) by selecting them to receive a gift certificate from us. They can in turn, r the fatherhood resources and programs they need to serve fathers and families. Are you a fatherhood leader with an organization? Consider promoting this giving option to your own network of donors and supporters to help you get the fatherhood resources you need for the coming year. Seriously - the people closest to you are the ones that are most likely to help! NFI is a 501C3 non-profit, so all donor gifts are tax deductible. Click here for a sample letter you can send to your supporters to encourage their donation to help you better serve dads. Select an organization you already know could use your help. If you don't have an organization in mind, use our brand spankin' new FatherSource™ Locator. Just type in your zip code and a map appears of organizations in your community that help dads and can also use your support. Visit our donate page and on the "in honor of" line, just add the requested information about the organization you would like to give in honor of. 3) Stand Back and Look Awesome! 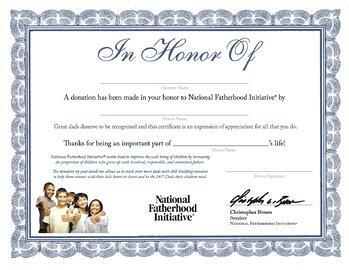 We'll send your selected organization a certificate showing your support...a real certificate (shown below)...and we'll help them select the NFI fatherhood resources that best meet their needs. $75 > Purchases a set of fatherhood skill-building brochures. $150 > Purchases a workshop for dads like one of our Doctor Dad® Workshops for New Dads. $600 > Purchases one of our fatherhood programs, such as 24/7 Dad®. 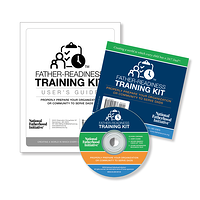 $1,000 > Purchases the Father-Readiness Training Kit™, for helping organizations build a foundation for serving dads and their children. Thank you for considering this giving option. Fathers and families in communities everywhere will benefit—including yours!